All work guaranteed 10 years! Hi, thanks for visiting the website! Please let me tell you a bit about ASG. 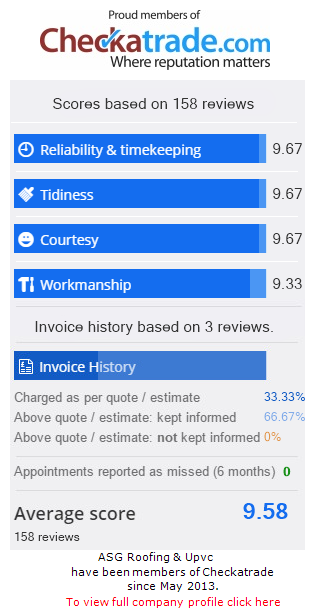 We have built a reputation on Checkatrade and also are recommended by Buckinghamshire County Council Trading Standards. As a family business, that’s something we take pride in. Our scoring on Checkatrade based on 114 jobs is 9.88 out of 10. 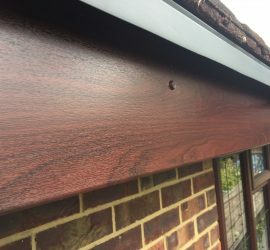 The quality of the work we do is proven by customer feedback, so please visit us on www.checkatrade.com/asgroofingandupvc and see for yourself. To date we have no complaints in any area of our business full stop. We take pride in customer satisfaction, and we guarantee that you will be satisfied with your job. Our pricing is very competitive for the standard of work which we produce. We’re prompt, take on one job at a time and we don’t leave until the work’s completed, and 99% of the time the work is completed in the estimated time, weather permitting. If you would like a free, no-obligation quote, with free advice, please call us to arrange a convenient time for yourself. 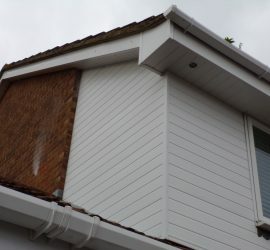 We have no salesmen, you only speak to the proprietor (Which is me, Steven Davies) We like our customers to feel no pressure and to have a good, comfortable experience in deciding how to improve their properties from start to finish. You also have by law a 14 days cooling off period to change your mind about anything, but you can waive this if you prefer work to start sooner. We take no deposit for any work agreed, all work is to be paid in full on completion or as agreed. We hope you will take the time to call us over for a quote, as your custom is greatly appreciated. Rest assured, if you choose ASG Roofing to carry out your work, you will not be disappointed. 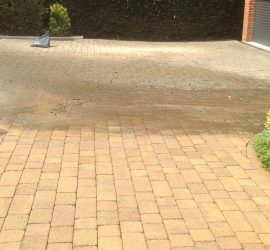 In addition, our pressure washing division is equipped with top quality industrial cleaning machines which are much more powerful than household washers, giving us the ability to take on any cleaning job at a very reasonable cost. ASG Roofing is fully insured for public liability, provides a 10 year guarantee on all work, and we like to keep our customers well informed every step of the way regarding every aspect of the work that we do for them. Please get in touch for a free, no obligation quote on your property, and we will be happy to give you good, honest advice.